Converting files from one format to another can become a nightmare if one doesn't know the correct procedure or have the right software to do so. In this article we discuss how to convert a PDF file to JPEG using free online conversion programs or trial versions of paid software packages. If you find that you'd like to use PDF photos in other types of files, in a Power Point presentation, an MS word document, an Excel spreadsheet or other trans-archive application, first you'll need to convert your PDF photo to JPEG. So how can you do that? Well, there are several quick and easy methods you can use to convert a PDF to JPEG format. Not only are the principal methods simple to use, but are located at free online file conversion sites. 1. Select the PDF file you wish to convert to a JPEG. 2. Choose the format you wish to convert to, in this case JPEG. 3. Enter the e-mail address you want the converted file(s) sent to. 4. Click the convert button to start the process. Your next stop will be the Omniformat file conversion site. This one is a bit more complicated to do but not terribly so and is also free – my favorite price for utility software applications. 1. Download the Omniformat conversion software. 2. Download the PDF 995 software. 3. Install both software packages. 4. Select and copy the PDF files into the Omniformat PDF995 conversion box and follow the prompts to convert your PDF to JPEG. This is no-cost utility software which means you’ll need to put up with commercial advertising pop-ups and other sponsor ads at the start of the program in order to be able to use the software. If you can stomach that, then you can get your PDF files converted to JPEG at no cost. 1. Download the trial version software. 2. Select and input your PDF file. 3. Follow the prompts to complete your conversion. If you like the software and must regularly do this type of file conversion, you can always purchase the software at the end of the 15 day trial period. There is other conversion software also available from this site. The handy utility site at CNET has a selection of pdf file conversion software available for free download. PDF TIFF Free is one of their most downloaded PDF converter application software packages which can convert PDF files to a variety of other image formats. 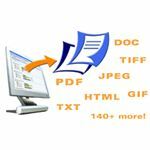 Another site I’d like to mention is Convertpdf toword.net which offers a string of conversion software options from PDF to other formats with a series of quick, easy, simple steps. The conversion software is free and relatively hassle-free. Another informative option is via using videos to demonstrate the process of converting PDF files to JPEG. One such video is for Universal Document Converter which offers a trial version of its software. DeskUNPDF allows a variety of conversions from PDF to other formats. A descriptive video on several of the PDF file conversion process explains in simple detail how the conversion software functions. Converting a PDF to JPEG format need to be the headache you might imagine. Try one or several of these options to make your next conversions faster, simpler and easier than ever before.